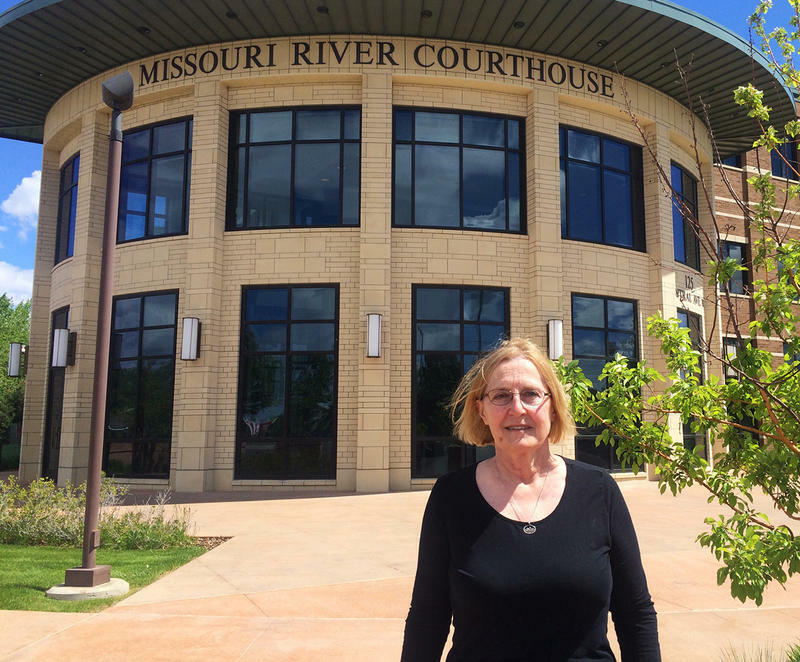 Northern Plains Resource Council member and lawsuit declarant Dena Hoff outside of Missouri River Federal Courthouse on May 24, 2018. Activists organized by Northern Plains Resource Council, which is bringing the legal challenge along with the Indigenous Environmental Network, and other conservation groups, rallied on the evening before the hearing. They say the pipeline say was approved without proper environmental review. The Keystone XL’s proposed route would run through northeastern Montana on its way to Nebraska carrying raw oil material from the the tar sands of Alberta, Canada. 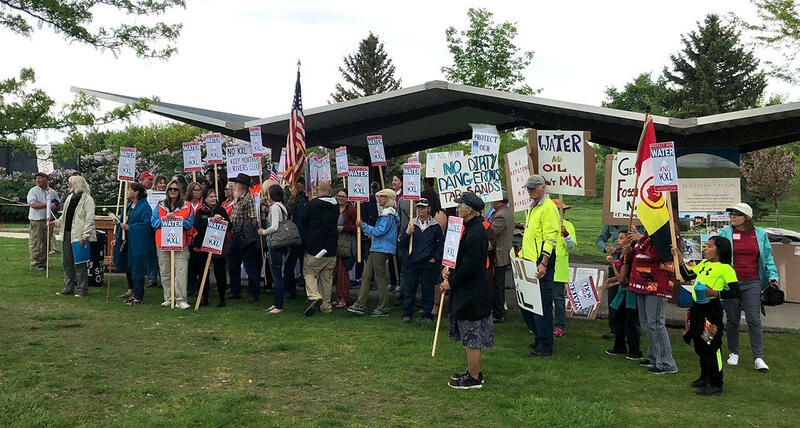 Protesters marched along Central Avenue in Great Falls, from the east to west bank of the Missouri River Wednesday evening, carrying signs that read things like "Water is Life" and "#No KXL". Passing traffic occasionally drowned out their voices. "I know we do need it, but there's safer ways. 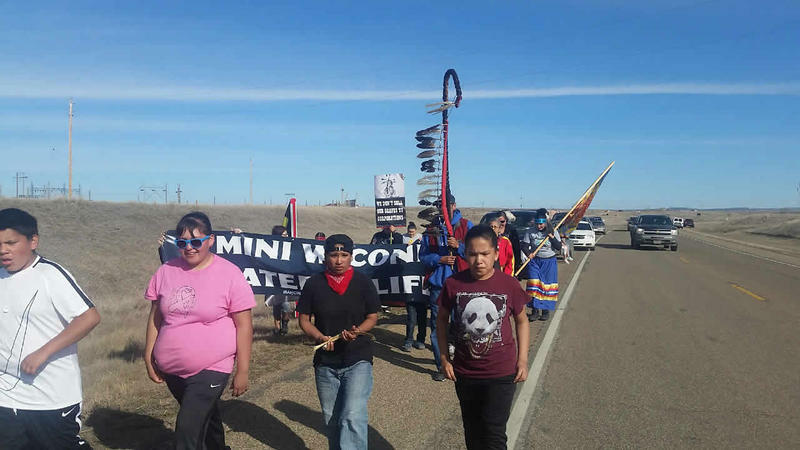 There's got to be safer ways," says Marina Starr, a mother of five who lives on the Fort Peck Indian Reservation. She says the Keystone XL proposal is just east of her home. 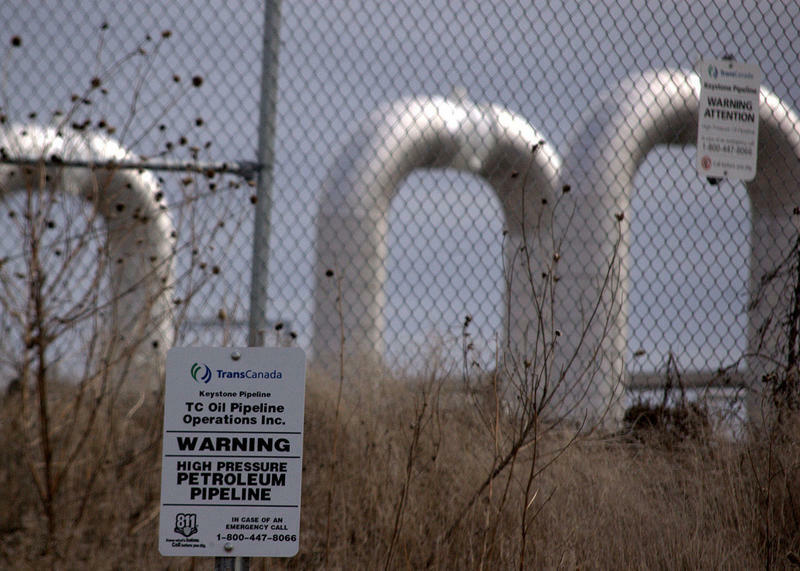 "It’s the danger of the pipeline breaking, which it will eventually, sooner or later. And the danger of it contaminating our water intake treatment plant on the middle of the reservation. We pull our water from the Missouri River, which feeds out into all the homes, Native and non-Native. That’s where we get our clean water." Before walking just over a mile along along the river trail passing by skatepark and horseshoe club, the protesters rallied at Riverside Park. Under a picnic pavilion, two tables were loaded with sandwiches, apples and water. Organizers occasionally herded the protesters together to make sure that the media cameras pointed at them were framed full of the pipeline opposition effort. 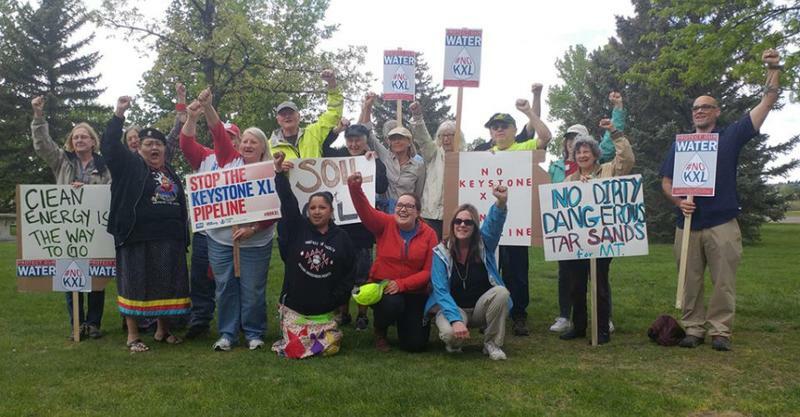 Protesters in Great Falls, Montana rally in opposition to the proposed Keyston XL pipeline, May 23, 2018. Dena Hoff, a farmer on the Yellowstone River near the Keystone Xl project, told the crowd that her concern is bigger then just regional water issues. "You know protest against injustice is a moral obligation for everybody. This pipeline and the expansion of the tar sands development in Alberta is of great concern to people all over the world who are living right now with climate change devastating their way of life." Northern Plains’s lawsuit says, “In its rush to approve the permit for Keystone XL, the State Department and U.S. Fish and Wildlife Service blatantly disregarded fundamental environmental laws." And it says that much of the environmental impact analysis of the pipeline was done before its final path was known, notably in Nebraska where the pipeline was approved although along an alternative path by the state’s utility regulators last November. Attorneys for the federal government argue that pipeline opponents haven’t proven violations of laws, including the National Environmental Policy Act and the Endangered Species Act. They say that even if their environmental analysis is legally flawed, the presidential permit approving the Keystone XL shouldn’t be overturned. Instead the government should be given the chance to offer a remedy for their errors. Industry and many top political leaders in Montana support laying the nearly 1,200 miles of 36 inch wide Keystone XL pipe. They say it will be a shot-in-the-arm for economic growth. Jessica Sena, with the Montana Petroleum Association, says a pipeline, while not leak-proof, is much safer than moving the project on rail cars or with trucks. She also says it would create much needed jobs to the area, although many of those would be temporary during the pipeline’s construction. "Several hundred new jobs created from the company that would become the largest, if not one of the largest property taxpayers; that’s huge," she says. "So the jobs, the economic impact that would be seen in Eastern Montana that has struggled because of the lack of oil production and the lack of oil revenue would certainly see immediate benefits." Sena says products made with oil are ingrained into nearly everyone’s daily routine, and if one pipeline is stopped that won’t stop oil being drilled for, pumped, and shipped across the world. Senators Steve Daines, a Republican, and Jon Tester, a Democrat, have in the past pushed for the pipeline to move forward. So has Democratic Governor Steve Bullock, who criticized former President Barack Obama for halting the project during his administration. When President Trump approved Keystone XL permits last march, Republican Congressman Greg Gianforte called it, “A huge victory for Montana”. Federal Judge Brian Morris did not issue an opinion on the lawsuit Thursday. A separate lawsuit in Nebraska is challenging state regulators approval of an alternative route of the Keystone XL.